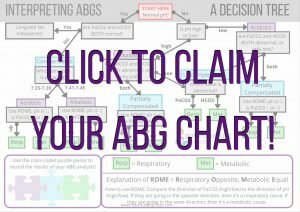 Med-Surg is hard enough, you need an easy way to interpret ABG values! It’s difficult to remember all the different normal values, what they mean, and which direction they’re supposed to be going to when an imbalance is occurring. When you’re integrating so much information, it’s super easy to get mixed up and make a silly mistake on an exam, even when you really DO know how to interpret ABGs. When I’m teaching, I usually prefer to focus on the “why”, but in this case it’s important to learn the “How to.” I strongly recommend that you take a few minutes to remind yourself of why we interpret ABG values in order to assess Respiratory Imbalances and Metabolic Imbalances. We don’t only want to interpret ABG values for fun, they have a very important purpose! 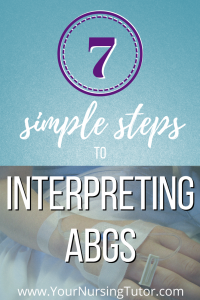 The goal of interpreting ABG values is so that we can decipher what is happening to our patient, so that we can implement a plan to help them improve. 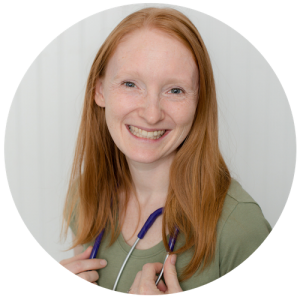 Is it acidosis, alkalosis or normal? Is it uncompensated, partially compensated, or compensated? Is it respiratory or metabolic? This might seem counterintuitive, but let’s start with what we’ve memorized. I don’t recommend memorization as your primary study strategy, but it DOES have its limited uses and this is one of them! If you don’t already have the lab values for pH, PaCO2 , and HCO3– firmly memorized so that you can write them down in less than 15 seconds, then you need to work on that first. It’s that important. So across the top of our page, take about 15 seconds (or less!) to write down the normal values for the three most important ABG lab results: pH (7.35-7.45), PaCO2 (35-45), and HCO3– (22-26). This is one of our major reference points so that we don’t get accidentally confused later. Let’s give ourselves another reference point that will help to prevent confusion later. Underneath our normal pH range, write “acidosis” and “alkalosis”. Then draw arrows in the appropriate direction to remind us of which direction is acidic (down), and which direction is basic (up). This will remind us later that the smaller numbers on the pH scale are acidic (1-7), while the larger numbers are considered basic (7-14). We’re almost ready to interpret ABG values, but first we need one last reference point! Underneath PaCO2, and HCO3–, draw arrows to remind you what abnormally high and low values would do to the body’s pH. For example, PaCO2 remember the hydrogen will follow carbon dioxide. So if the body starts holding on to carbon dioxide (which makes PaCO2 increase), then hydrogen will also increase. Hydrogen is acidic, so if hydrogen increases, then the body’s pH will become more acidic. That means the pH will decrease because acid is on the 0-7 part of the pH scale. If the body starts getting rid of carbon dioxide, then hydrogen will also decrease. Again, since hydrogen is acidic, then removing hydrogen removes acidity. The result is that the body becomes more basic, and the pH will increase. We follow the same logical process for HCO3–, but we pay attention to the different anatomy and physiology of how it functions in the body. HCO3– is also called bicarbonate, and it functions as a base in the body. So when we start losing HCO3–, we are losing base, which moves the pH of the body down towards the acidic side of the scale. If we start holding on to HCO3–, then pH will move up towards the basic side of the scale. So far, we haven’t even looked at the question yet, we’re just trying to prevent any silly mistakes!! You can choose to memorize these directional reference points, OR make sure that you understand the underlying mechanisms and can figure it out on the spot. Personally, I prefer to understand the underlying mechanisms and “figure it out” every time I interpret ABG values. I don’t trust my rote memory in a testing situation because there is no way for me to double check if I am right or wrong. But if I understand the basics about the underlying mechanisms, then I can go through the whole process in my mind and feel confident that every arrow is pointing in the correct direction. If I have practiced this ahead of time, then it only takes me a few seconds, and I feel so much more confident that I’m remembering everything correctly. Now we are finally ready to assess the patient’s ABG values. Start by looking at the pH and decide if the value is normal (7.35-7.45), high (>7.45), or low (<7.35). This should be super easy since you already wrote the reference values for pH at the top of your scratch paper. Here’s where the decision making really begins. If the pH is abnormal, continue to step 5. If both are normal, then you patient does NOT have an ABG imbalance. You’re finished! If one OR both of these values is abnormal, then continue to step 5. Step 5: Identify Alkalosis or Acidosis. At this point, you know that your patient has an imbalance, so we need to figure out what kind of imbalance. If the pH is abnormal, compare it to the reference arrows you wrote at the top of your paper and pick the imbalance that matches that direction (>7.45 is alkalosis, <7.35 is acidosis). Continue to step 6. If the pH is normal but at least one other value was abnormal, then choose the direction that the pH is “heading.” For example, 7.35-7.39 is toward acidosis, while 7.41-7.45 is toward alkalosis. Continue to step 6. You might be asking yourself, “What if pH is normal, one of the other values is abnormal, but the pH is 7.4? That’s exactly in the middle, how do I pick alkalosis or acidosis? ?” Great question! And my answer is: as a safe, effective, beginning nurse, you’re not going to be given a scenario like that. While it’s true that in clinical practice something like that COULD happen, it would be a very complex case a therefore beyond the scope of practice for a nursing student. So don’t worry about seeing a scenario like that on NCLEX. Step 6: Identify Uncompensated, Partially Compensated, or Compensated. We’ve figured out our first puzzle piece, now let’s discover our second puzzle piece. We have 3 options this time. If pH is normal and PaCO2 and HCO3– are BOTH abnormal, then the patient is compensated. Continue to step 7. If pH is abnormal and PaCO2 and HCO3– are BOTH abnormal, then the patient is partially compensated. Continue to step 7. If pH is abnormal, and either PaCO2 or HCO3– are abnormal, then the patient is uncompensated. Continue to step 7. In nursing school, you’re most likely to be asked to interpret ABG values that turn out to be uncompensated. However, it’s good practice to be able to identify both partially compensated and fully compensated. And it’s not that hard, either, once you know how to do it! It’s finally time to get our last puzzle piece! Let’s look at the directions of the PaCO2 and HCO3– values. If only PaCO2 is ABNORMAL and HCO3– is normal, then it is respiratory. If only PaCO2 is normal and HCO3– is ABNORMAL, then it is metabolic. If PaCO2 and HCO3– are BOTH abnormal, then you need to reference your arrows and compare to your pH. Now that you have all the puzzle pieces you need, you can put them together to know exactly which acid-base imbalance your patient has, and (most importantly!) plan a strategy for addressing it. Hi I just came across this and although it’s a great explanation, in your first interpretation of pH you put in parenthesis acidic (down) as well as basic (down) instead of (up) . Sorry if this seems petty but it almost made me leave the page because I thought the article would not be credible. I stuck around though and it was really is helpful, just wouldn’t want anyone to miss out on the info. Thank you! What we say to it if both pco2 and hco3 is abnormal and ph remain as it is.yesterdy i performed 1 ABG,result was pH 7.35,Pco2 23.0,Hco3 12 .3,its obviously compensatory but wt actual medical term should i give it, in respect to metabolic and respiratory? Thank you so much for taking the time to share this organized, thoughtful process! The Lord God bless your efforts, your health, and your family! Thank you so much. I have never understood why it was compensated or otherwise until now. Thanks again. what if my patient having high partial pressure of co2 but low in hco3 ….. pH is low …. o2 saturation is low…. the patient is having severe acute exacerbation of bronchial asthma …. What is this condition for the patient? respiratory acidosis without compensation ? how to explain the low hco3 ?? Thank you so much for explaining compensation!!! It was a super easy explanation!!! Could you explain last part please! It was very helpful. Great explanation. It’s so easy to understand. i have been searching the internet for days trying to find a simple, right to the point explanation of partially compensated vs fully compensated. Other places make it so difficult! SO glad i found this! Thank you! you are a blessing, i thank God for you i have understood it firmly. If you saw it in a real patient, however, it COULD indicate that they are in the very early stages of an imbalance. Since the pH is still normal, then they are NOT currently having an acid/base imbalance, however. But if either the PaCO2 or HCO3 is abnormal, it could indicate that something is going wrong in that system (either respiratory or metabolic, depending on which value is abnormal). And if the underlying cause of that imbalance is not addressed, then it could eventually lead to an abnormal pH. Thank you! This was the easiest way to understand the ABG system! 1. Though all the values are abnormal in partially compensated, why it s called as ” partial “? Thank you so much. I am in my last semester of nursing school and truly never understood how to interpret and analyze ABG’s until I read this. You are awesome! your ABG explaination was very helpful, i always struggle with partial and fully compensated one. Thanks for the help. This help a lot. Please notify me I just sent you A question. What do you do if the pH is normal PC03 and the Hc03 is in normal range. How can you tell if it is acidosis or alkalosis if everything is in normal range. also if the Pco2 is 41 and the Hc03 is 25.5 ph is 7.4 should it be respiratory or metabolic. Some times numbers are in normal range they are not greater than or less than. So I do I Interpret. I am lost with the arrows also. Can you help? Good question! I only talk about abnormal values in this article, but if all those values are in the normal range, then the patient is normal! No imbalances, so you wouldn’t have to pick acidosis/alkalosis. Same with respiratory/metabolic; if there is no imbalance, then you don’t have to identify an underlying cause. thanks for showing a easier to understand ABG. Hello, thank you so much for this amazing explanation! I was just wondering, and this may be a stupid question, but what effect does the PaO2 have on the ABG? thank you so much, have a good night. When you’re interpreting ABGs, the PaO2 doesn’t add info. That’s why I basically ignore it in this article. Obviously, it is important data when you’re working with a real patient, and it tells you about their oxygenation status. this was very helpfull. makes it actually easy to understand all tyhose figures. perfect review for the nclex….thank you. Thanks so much studying for finals and this helped so much! I cant believe this worked perfectly for me. Med Surg is giving me nightmares. Glad I took the time to look at it. For the first time ever, it finally clicks! thank you so much!! Yay! Sometimes it just takes a different perspective on how to explain it. Glad this helped! You are such an angel sent from up above. Thank you thank you thank you thank you sooo much for this! Seriously. The explanation of compensated, partially compensated and uncompensated was very helpful! Thank you! 6b and 6c are confusing.Its like you interchanged.Is it if PH is abnormal and either CO2 or HCO3 are normal that is partially compensated? I think there are several mistakes within this article, that being one of them. It appears that you won’t get a response due to the original posting date. #2. Basic is up, not down…. #6b if nothing is normal it is partially compensated. #6c if either CO2 or HCO3 is normal it is uncompensated. But I hope this helps. 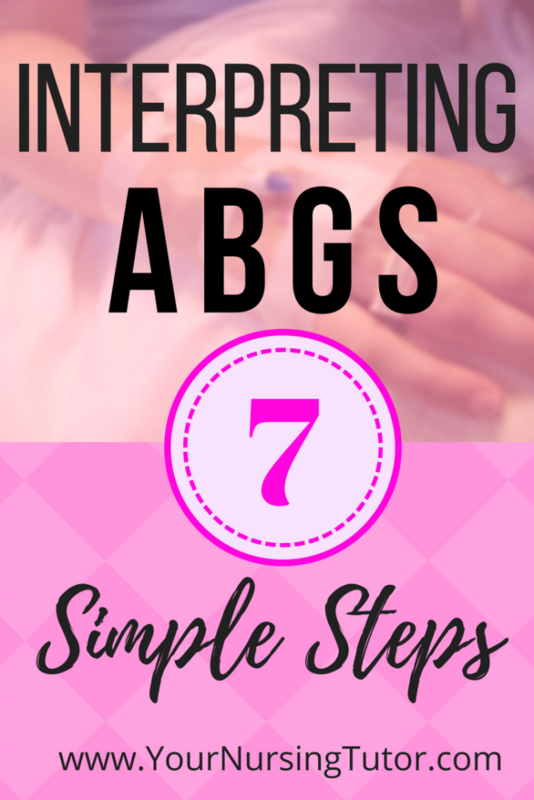 Check out Pinterest for ABG’s nursing…. Great post. do you think you could add a few examples? OMZ! THANK YOUUUUUU! I AM NOT A NURSING STUDENT BUT IT WAS DISCUSSED IN OUR GEN BIO AND I FOUND IT VERY DIFFICULT AND PUZZLING BUT THEN I READ THIS AND I GOT IT!!! THANK YOUUU VERYY MUUUUCH! I’M SO HAPPPPPY!!! !